The market of online grocery delivery services is saturated, but a new-to-D.C. company promises quality foods, delivered in one to two hours. WASHINGTON — Craig Auster studies his iPhone in Magruder’s, a small, family-owned grocery store in the Chevy Chase section of D.C., and navigates his way to a crate of sugar snap peas. He rips a plastic produce bag off the stand and meticulously sifts through the green peas, checking for any flaws, filling the bag and weighing it until it reaches precisely half a pound. The bag of produce isn’t for the 28-year-old’s personal pantry. 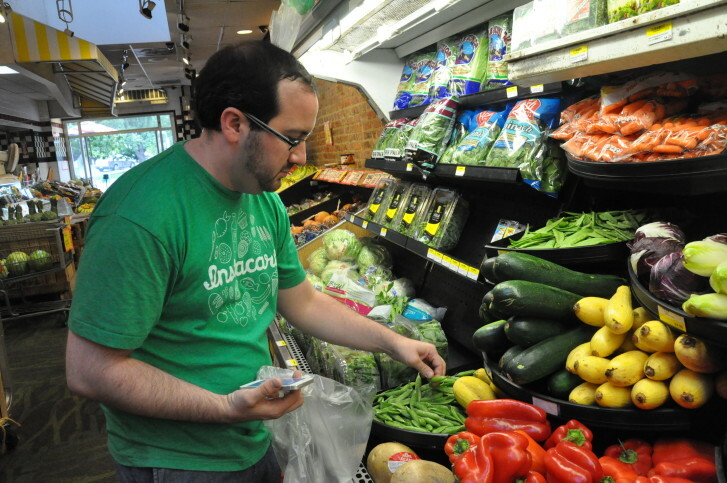 Auster, who wears a bright green T-shirt detailed with grocery illustrations, is a personal shopper for Instacart, a grocery delivery business that began in San Francisco in 2012 and launched in the D.C. area four months ago. Washington has no shortage of online grocery delivery businesses — there’s Peapod, Relay Foods and a handful of other services, including Safeway’s own delivery program. But Erika Hard, city manager for Instacart, says the company’s model differs from others because it’s an on-demand service. It delivers most grocery orders in less than two hours to customers in D.C. and parts of Northern Virginia and Maryland. A one-hour delivery option also is available for a slightly higher fee. “If you’re coming home from work and you’re stuck in traffic, and you want some groceries at your door by the time you get home, we can accommodate that,” Hard says. Customers can also place advance orders for parties or events. Those in the D.C. area can select grocery items online or via the Instacart app from one of six local stores: Whole Foods, Safeway, Harris Teeter, Costco (no membership required), Yes! Organic Market and Magruder’s. Once Instacart receives the order, Hard assigns the grocery list to one of the roughly 100 Instacart personal shoppers in the area. In the parking lot outside of Magruder’s, Auster gets a text message on his phone that directs him to his Instacart shopper app. A customer’s order of rice crackers, plantain chips, grapes, sugar snap peas, goat cheese and chocolates pops up. He heads into the store and begins to fill the order. As he places items in his basket, he occasionally scans a barcode to make sure the item he selects is the correct variety. Then he checks it off the list on his app. Auster joined the Instacart team about two months ago. The Capitol Hill resident had finished working on a campaign and was in between jobs. “I was looking in the food/beverage/hospitality section [of Craigslist], thinking maybe I would be a waiter, and then I saw this posting and it just seemed so much more fun and interesting,” says Auster, who admits he’s always enjoyed grocery shopping. Auster says one of the best parts about being a personal shopper is the flexibility of the job. Every Thursday, he lets Hard know what days and hours he’s available to work the following week. He says he fills anywhere from two to 10 orders a day, and that his fastest delivery, taking into account D.C. traffic, was about 40 minutes. Auster says his pay is based on the hours he works and the deliveries he makes. The New York Times reports Instacart’s shoppers can earn between $15 and $30 an hour; typical supermarket employees make about $9 to $11 per hour. But not just anyone can be an Instacart personal shopper. Potential shoppers are required to take an online “grocery challenge” as their first round of training. “And then we’ll bring them in for a formal training where they can learn how to navigate the shopper app and also get some really rigorous produce training on how to pick out the best bananas and the best avocados,” Hard says. The role of a personal shopper also requires interaction with the customer. “Some of our shoppers even put little treats in the bags for every order that they do,” Hard says. If the store is out of an item the customer selected, often the shopper will call the customer and recommend a similar product or obtain approval for a substitute. “Everything is totally specific — from the brand, the flavor, the size — and if something’s not available, I have to do my best to find them a replacement,” Auster says. It relies on existing grocery stores and an existing population of workers with cars who want part-time or flexible work. The company makes its profit by marking up the store’s price. Through Instacart, a pound of sugar snap peas is $4.99; in Magruder’s, it’s $2.79. The mark-up differs from product to product. The delivery fee is $3.99 for every order over $35; the one-hour delivery fee is $5.99 for orders over $35. The Costco delivery fee is more expensive ($9.99 per order), mostly because the orders are often large and pack the cars of the personal shoppers, Hard says. In addition to delivering grocery items, Instacart also delivers beer and wine to customers in D.C. and Virginia, and liquor from Magruder’s to customers in D.C.
“One of our customer bases is young professionals and they like to stock up on beer and wine. It’s pretty easy, especially if you didn’t prepare adequately for your weekend,” Hard says. Auster, who has run more Instacart deliveries than he can remember, says he’s getting the swing of things; he’s even met other personal shoppers within the company. They’re easy to spot in their green Instacart shirts, he says. Instacart operates in 10 other U.S. cities and hopes to be in 17 by the end of the year, Hard says. It’s open seven days a week, from 8 a.m. to 11 p.m., including holidays. Right now, Hard is busy predicting what customer traffic will look like for the weekend of July Fourth.